Flying at 30000 feet above the desert with the volcano’s of the pacific rim towering over the horizon, one can’t help but stare in awe at natures beauty. A similar feeling of amazement washed over me as I gazed at the massive buffet at the Wynn Hotel and Casino on my recent guys trip to celebrate the upcoming wedding of two great friends. Though this is no ordinary Vegas feeding trough, with deli meats and cheeses that cost more than most steaks, veal, lamb, prime rib and enough Alaskan King Crab legs that it makes you wonder if all the crab from The Deadliest Catch comes directly here. Simply called “The Buffet” this over the top Vegas eatery takes all kinds of gourmet cuisines and drops them all in one spot. Let’s run down the list of everything that I sampled, shall we? Aged Gouda & Edam cheese, prosciutto, grilled sea bass, seared red snapper, grilled mahi mahi, veal scallopini, hand carved veal loin, lamb osso bucco, veal short ribs, gnocchi, cheese ravioli, Roasted rack of lamb, hand carved prime rib, Thai beef salad, pot stickers, prawns, nann bread with hummus and Alaskan King Crab legs with drawn butter. I feel full again just from writing it all down! I don’t even know where to start, The lamb was fantastic both ways and the osso bucco had marrow in the bones that was incredible (don’t knock it until you try it). The prosciutto would be at home on a meat and cheese platter in Italy, the veal short ribs were as tender as melted buter, however the scallopini and the hand carved veal loin were quite tough. the red snapper and the mahi mahi were great but the sea bass was out of the world, with a texture similar to pork tenderloin. both pasta dishes were very good. 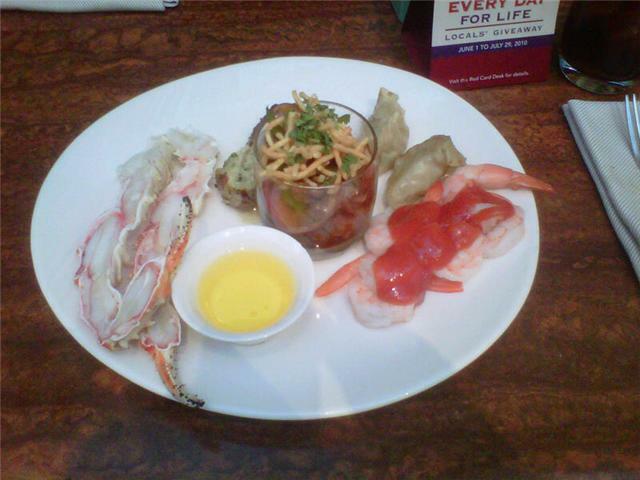 The prime rib was also very good but the highlight for most people at “The Buffet” is the alaskan king crab legs. I’m not a crab leg kind of guy as they are a lot of work for a comparatively small amount of crab. Don’t get me wrong, they were really good, it’s just that the sight of people piling up two full plates of them just because they know they’re expensive only to eat five of six and throw the rest away makes me a little sad. Vegas by in large is an incredibly wasteful place, with no recycling anywhere on the strip, 5 ton trucks driving up and down Las Vegas Boulevard for the sole purpose of advertising prostitution and millions of gallons of water wasted every year so that people in a taxi line stay cool under mist sprayers. You’re in the desert people, it’s hot!!!! Those are the kind of people that buy Time Shares and play $5 blackjack and take it seriously. But enough about the sad state of humanity, lets talk about dessert. 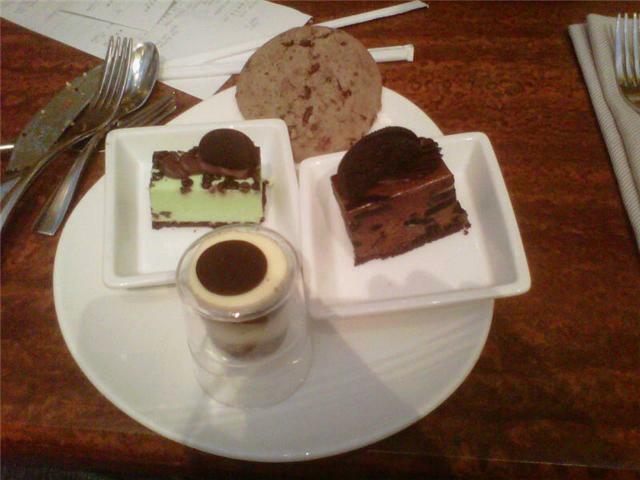 I tried the chocolate mint mousse, the Oreo chocolate mouse, the tiramisu and a chocolate chip cookie. I have mentioned before that I’m not big on sweets but the Oreo chocolate mousse and the cookie were terrific. 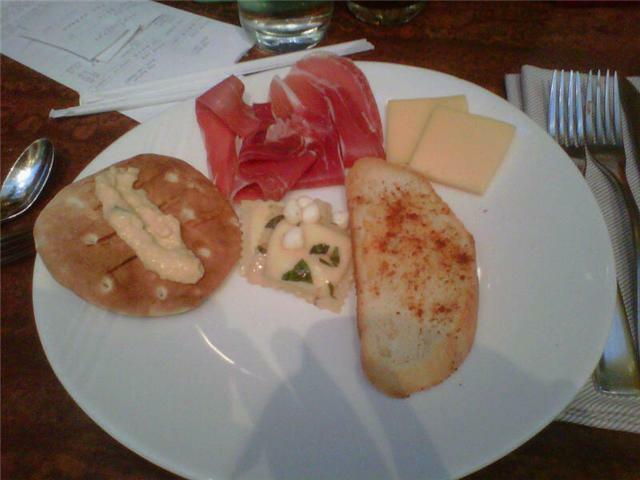 Sorry there’s no pictures of the meat, I forgot to take one before I ate it all. So go to Vegas and go to this buffet because it’s totally worth the price of admission, just don’t be greedy for greeds sake, try to walk as much as you can when you’re there and don’t believe anyone who says they can get you into a club for free, they’re lying.